In the modern era of self-publishing, the notion of writing a cover letter may be a foreign one to you. Most literary journals and magazines that allow submissions expect you to submit a cover letter along with your short story, poem, or essay. The cover letter serves as an introduction of your work as well as your identity as a writer. It can bridge the gap between publication and rejection. 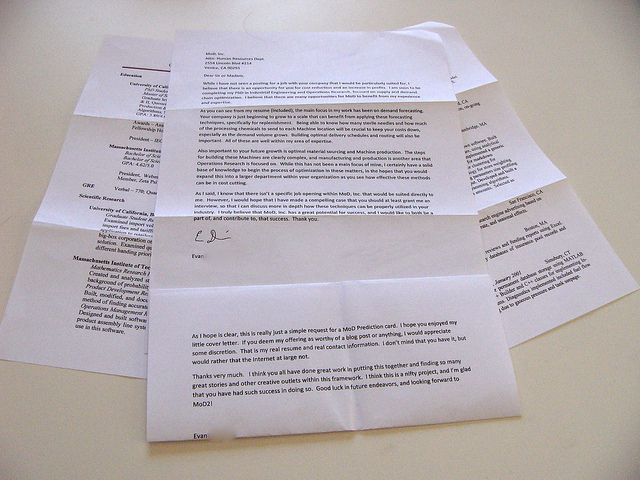 Writing a cover letter is one of the most important things you can learn to do correctly. Here’s a handy guide to insure your next cover letter receives the attention your hard work deserves. I live in suburban Georgia, where I work as a student and a freelance writer. I enjoy reading Feature Story Magazine and am hopeful that you’ll find my story to be a good fit. We can break this letter down into several different points for emulation. To write a great cover letter, check your spelling and grammar, do your research, and trim the fat wherever possible. Follow the example. You can do it, I promise. Remember these rules, take some risks, and don’t give up. Good luck! Thank you so much! I’m glad I can help. I’ll bookmark your blog and check once more right here frequently. I’m reasonably certain I’ll learn many new stuff right here! Good luck for the following! Thanks for your input! I appreciate it. Thank you so much for your flattering words and ongoing support. I look forward to seeing you around the site! Unfortunately I don’t know much about widgets… you might want to try Googling it. I’m sure you’ll find something. 🙂 Good luck!